Last week, Invesco announced the planned acquisition of Oppenheimer Funds following the successful integration of Guggenheim ETFs. We have benefited from the consolidation of the industry and we’re not surprised by the news. We expect additional accretive deals to be structured and lead to an acceleration of the growth and scalable profitability. In 2017, we saw the return of Bruce Bond, more geographic diversification, and the consolidation of two of the largest ETF trading firms, KCG and Virtu. In 2016, BATS acquired ETF.com and CBOE acquired BATS. These actions put the CBOE on the map for ETFs. 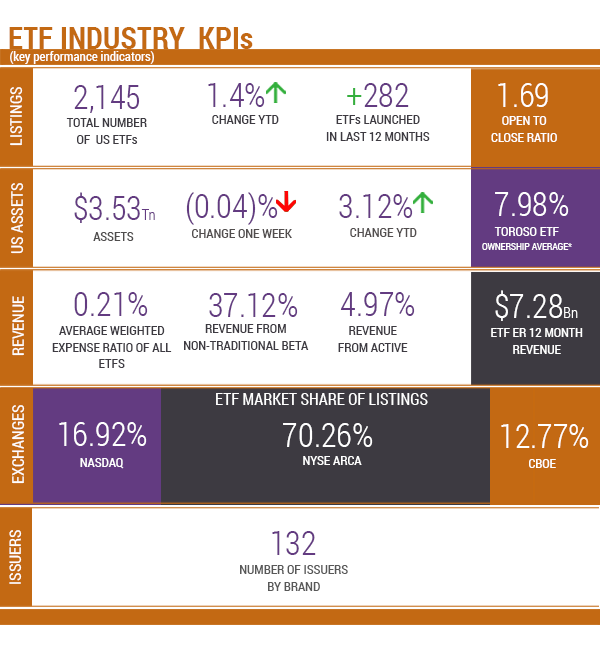 Currently, they have 12.8% of US ETF listings. Additionally, in 2016, American Beacon, Hartford, JPM, Oppenheimer, Victory, Virtus, NY Life, and Columbia all made acquisitions of small firms to gain access to ETF growth; a bold move for traditional mutual fund and insurance companies. During these three years, many of the acquisitions focused on expanding indexing intellectual property. We also saw Janus enter the ETF space by acquiring Velocity Shares right before a jump in market volatility. The most important acquisition in ETF history is Blackrock taking over iShares from BGI in February of 2010 for 13.5 Billion. Today, iShares represents about a third of BlackRock’s assets. If we assume iShares is a third of Blackrock’s value, the 13.5-billion-dollar investment is now worth an estimated 22 billion. There are a number of ETFs that track M&A within the broad market that are designed to produce modest but stable returns through arbitrage. TETF.index tracks the growth unlocked within the ETF evolution and ecosystem from a natural progression of M&A activity. Many private firms spend huge amounts of money to accelerate adoption and the growth of the industry which ultimately are reflected in the industry’s penetration and growth. To that point, we believe that ultimately the “old guard” will have to buy or build to survive. As reflected by the growth, the industry is growing at a remarkable pace (15-20%). Put simply, now that investors have figured out the benefits of compounding growth on a tax-deferred basis, with fewer fees, and with transparency, why will they ever turn backward? What investor who has used an ETF will turn around and swap an ETF for a more expensive, less transparent, and less efficient wrapper? What investor wants to pay more for less? Returns as of October 22, 2018. As of October 22, 2018. Source: Morningstar Direct.